The Red Knight Outfit in Fortnite BR. You can buy it from the Cash Store for 2,000 vbucks. 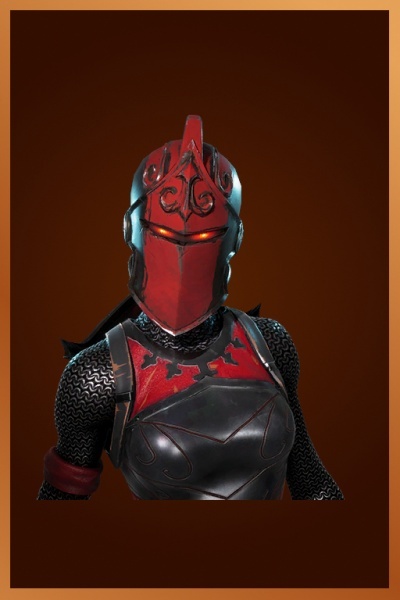 Red Knight is the name of one of the outfits in Fortnite Battle Royale. red knight (skin) red knight is an outfit skin in battle royale that can be purchased from the item shop. the red sheild back bling skin is bundled with this outfit "the red menace of anarchy acres". It was in the daily item shop for 2 days in late December for 2,000 Vbucks, along with a final 4 days in mid-January. It was also on for the last two days of season 2 so far. Even though it looks like it is part of Season's 2 theme, it has been confirmed by an Epic employee that its not a season exclusive, it may return in the future. Confirmed by Epic to come on 7/5/2018.